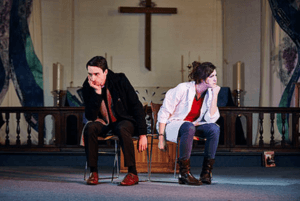 When the Upper School Religious Studies pupils were told that we were to attend a performance of James Cary’s The God Particle we were unsure what to expect. The performance, by the writer of the BBC’s hugely popular series Miranda, was successful in exploring the ambiguous relationship between science and religion. Captivating the audience with its unusual combination of romance and sci-fi, the performance put this universal conflict into a context we could all relate to. Whilst generating many laughs from the audience, Cary developed and cemented our understanding of what we had previously covered in the classroom, whilst also allowing his young audience to form our own opinions of what we witnessed on stage. The importance of keeping an open mind acted as a key theme throughout the unfolding storyline. It was the main driving force, as the scientist and vicar set out on their quest to discover the truths surrounding faith, knowledge and love. The performance allowed us to visualise this linear debate in a creative format and opened our eyes to different views and opinions that have stayed with us long after the performance ended. Pictured above is the post-show Q&A chaired by Rev Kerr.